Tachypnoea in a well baby: what to do next? It is not uncommon to see babies in clinic who have been referred because they are persistently tachypnoeic. Sometimes this has been noticed by the parents, but more often, especially if it is the parents’ first baby, they do not realise anything is amiss, and it is the midwife, health visitor or general practitioner who brings it to their attention. Occasionally it has been noted as early as the postnatal ward. This article outlines a management approach to a term baby with tachypnoea in an outpatient setting, and is not focusing on acutely unwell infants (figure 1). It is taken from the perspective of a referral to a general paediatric clinic, although these babies are also often referred straight to a respiratory clinic. 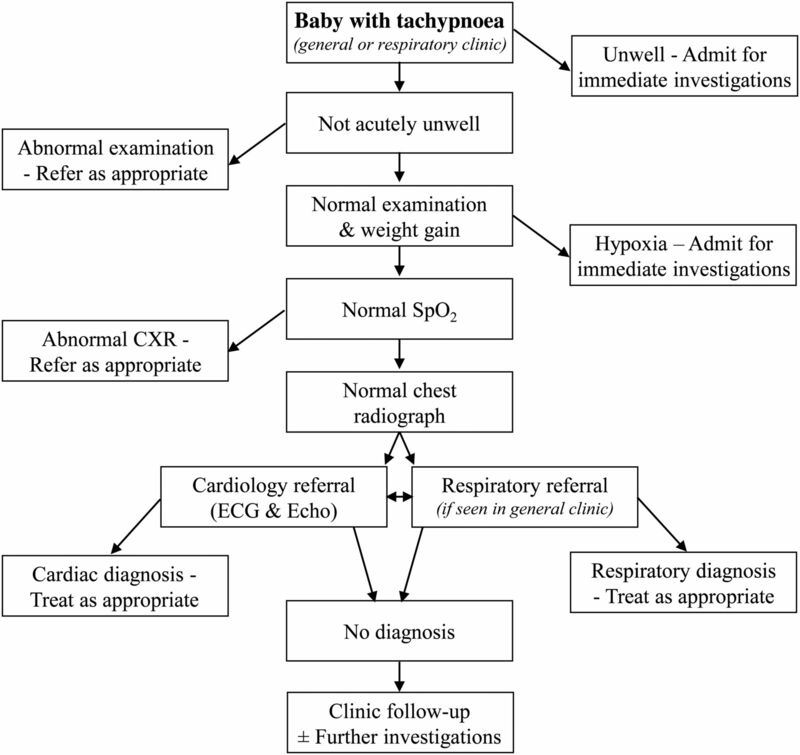 Algorithm for management of a baby with tachypnoea. CXR, chest radiograph; SpO2, oxygen saturation. Given the baby has been referred to an outpatient clinic, it is likely the child is not acutely unwell. Nevertheless it is important to be certain, and if it is an issue, the child may need to be admitted to hospital. Clearly an acute lower respiratory tract infection (including bronchiolitis) must be excluded. The WHO threshold for tachypnoea, as an aid to diagnosing acute respiratory infections and the need for antibiotics, is set at 60 breaths/min for infants <2 months, and 50 breaths/min for those aged 2–12 months.4 ,5 However the rate alone is not necessarily diagnostic of infection or associated with the severity of the respiratory illness, as the normal range is so wide in healthy babies.5 Fever is associated with tachypnoea, and every 1°C above 37°C raises the rate by approximately 5–7 bpm.1 Certain symptoms elicited from the history at this stage are red flags for concern of a significant underlying condition (box 1). Consider also the possibility of a foreign body when an older sibling may have put something in the baby's mouth. Examination focused specifically on the cardiovascular system is also important and often neglected. Central cyanosis is most evident in the mouth, and the cardiac apex may be visibly displaced if there is cardiomegaly. Precordial palpation may reveal a right-sided impulse in Scimitar syndrome, or complex forms of congenital heart disease associated with atrial isomerism (visceral heterotaxy or a mirror image arrangement in primary ciliary dyskinesia). A prominent precordial impulse is an important sign of cardiovascular disease with pressure or volume overload of the heart. Femoral pulses which are weak or difficult to feel (coarctation of the aorta), or generally weak pulses (myocarditis, dilated cardiomyopathy, severe aortic stenosis or other forms of left heart obstruction) can be important signs. Liver enlargement is usually a manifestation of heart failure, but can be palpable if it is displaced by overinflated lungs. Unusually soft or loud heart sounds, ejection clicks, wide splitting of the second heart sound, a loud P2 or a heart murmur may indicate a cardiovascular cause. However, particularly in the newborn, heart murmurs are very common, while significant congenital heart disease during infancy is often not accompanied by a heart murmur. Always listen over the skull and particularly the occiput for the murmur of a cerebral arteriovenous fistula, whose only clinical manifestation might be tachypnoea. Thus whenever tachypnoea has a cardiovascular cause, even without a heart murmur there is usually a clinical pointer to a cardiac anomaly. The child's weight, height and head circumference will give an indication of faltering growth which may be secondary to tachypnoea or an underlying condition. Abdominal examination is done to exclude an enlarged liver or spleen, or an abdominal mass. A basic neurological examination is done, particularly for hypotonia which may indicate a neuromuscular disorder. The patency of the nose must be examined to exclude choanal stenosis or unilateral atresia (it may be necessary to pass a nasogastric tube down both sides). If the SpO2 is significantly low (<85%), one should consider a hyperoxia test.11 If the pulse oximetry SpO2 remains <85% in 100% oxygen, a formal test is carried out with arterial blood gases or transcutaneous oxygen monitoring from the right arm after administration of 100% oxygen for 5–10 min. If supplemental oxygen does not improve the partial pressure of oxygen in arterial blood (PaO2), cyanotic congenital heart disease or some form of right to left shunting must be considered with an immediate cardiology assessment. If there is a rise in PaO2, this points more towards a respiratory cause. Chest radiography is the other initial investigation. Clarity of the lung fields is important. If abnormal, the radiograph may indicate a number of potential diagnoses that would require further investigation and treatment. Some of the conditions that the radiograph may point to are infection (including congenital tuberculosis); air leaks such as pneumothorax or pneumomediastinum; pleural effusion including chylothorax; aspiration from gastro-oesophageal reflux, a swallowing abnormality or H-type tracheo-oesophageal fistula; interstitial lung disease; congenital thoracic malformation; Scimitar syndrome; congenital diaphragmatic hernia (CDH). Heart size, shape and position may indicate cardiac disease. The integrity of the diaphragm is checked (eventration, hernia, paralysis). Chest shape and size are assessed (eg, bell-shaped in pulmonary hypoplasia), as well as the ribs themselves, which may have the classic abnormalities of severe neonatal rickets, or be very thin (gracile) in neuromuscular disease. Additionally, as with any unexplained symptom in children, non-accidental injury must be considered and the ribs checked for fractures. At this stage, a well baby with tachypnoea (with or without some recession), who has a normal SpO2 and chest radiograph, can leave clinic and go home with follow-up in 4 weeks, or sooner if the clinical picture changes. However the child should always be referred immediately to a paediatric cardiologist, as well as a paediatric respiratory specialist (unless the initial referral was to a tertiary respiratory clinic). CT chest scan—this can be done without the need for sedation in most infants, using the ‘feed and wrap’ technique.13 There is no need for a contrast-enhanced scan at this stage. Dual probe 24-h pH study. Swallowing assessment—clinical evaluation and videofluoroscopic swallowing study. Ultrasound or fluoroscopic screening of the diaphragms. There are numerous causes of tachypnoea in term infants (reviewed by Sasidharan11). Often the tachypnoea is just one of several signs in a clearly unwell child, examples include, a baby with a metabolic acidosis for example from numerous rare metabolic disorders; bacterial sepsis; or significant pain, for example, from a volvulus. In some children, the cause is obvious on initial assessment, from the history, for example, narcotic withdrawal and postbirth asphyxia. In some, it may be determined on first examination, for example, the small thorax of Jeune asphyxiating thoracic dystrophy, bell-shaped chest from pulmonary hypoplasia, hypotonia associated with neurological or neuromuscular disease, stridor due to upper airway obstruction or even severe neonatal rickets. Below are some causes to consider in a child who seems well, has a normal clinical examination, but is without an immediately obvious diagnosis, with the relevant investigations that may provide the answer. Cystic fibrosis. In the UK and many other countries, newborn screening means babies are diagnosed with cystic fibrosis (CF) at around 3–4 weeks of age; however screening is not infallible. While most babies are symptom-free from the respiratory perspective, the majority have suboptimal weight gain, often with abnormal stools. Infants can present with tachypnoea, recurrent cough and sometimes wheeze,15 but our experience is that it is most unusual for tachypnoea to be the sole symptom in a baby with CF. Nevertheless it must be considered and a sweat test performed if appropriate. Interstitial lung disease. This is a heterogeneous group of rare diseases, most often accompanied by crackles, recession, hypoxaemia and eventually failure to thrive.16 However in some, tachypnoea is the only obvious symptom, and the severity of symptoms and signs varies. Consideration should be given to neuroendocrine cell hyperplasia, previously known as persistent tachypnoea of infancy; it is often associated with recession, crackles in the chest and sometime hypoxia.17 There is an airway obstruction element to the condition, but the prognosis is generally good, with symptoms resolving at a median of 18 months (range 6–60 months), although in practice it may be even longer.18 Inherited surfactant protein C deficiency, ATP-binding cassette transporter A3 and thyroid transcription factor-1 are important, although again other signs of respiratory distress are likely to be present.19 Surfactant protein B deficiency is lethal in neonates so is unlikely to present with just tachypnoea.16 A chest CT scan can be highly suggestive, although diagnostic certainty may require a lung biopsy. In cases of neuroendocrine cell hyperplasia, the appearance is quite characteristic with ground glass opacification, particularly in the right middle lobe and lingula, accompanied by air trapping and mosaicism.20 Blood for surfactant protein gene mutations can diagnose surfactant protein B and C deficiency, ATP-binding cassette transporter A3 and thyroid transcription factor-1 (NKX2.1) gene abnormalities. Congenital diaphragmatic hernia. This lesion is often diagnosed antenatally or within hours or days of birth. However late-presenting (>1 month) CDH is well recognised, and a review of these late diagnoses found 65% of right sided and 42% left sided CDH presented within the 1st year of life.26 Tachypnoea was the most common symptom, followed by vomiting. Diagnosis may be made on a chest radiograph but is not always obvious; chest CT or a contrast gastrointestinal study may be necessary. Diaphragmatic weakness. Compared with adults, the diaphragm is critical to respiration in infancy due to the fact the chest wall is so compliant, the mediastinum is more mobile and the intercostal muscles are weaker.27 Even unilateral diaphragmatic weakness can cause a degree of respiratory distress. At this age, phrenic nerve injury is the most common cause. When due to a difficult delivery, for example, following shoulder dystocia, the majority of infants with phrenic nerve palsy also have a brachial plexus injury (Erb's palsy).27 A number of congenital neuromuscular disorders can cause severe diaphragmatic weakness. One of them, spinal muscular atrophy with respiratory distress (SMARD1) is very rare and unlike more typical spinal muscular atrophies, presents with respiratory distress before distal muscular weakness is obvious. The respiratory difficulty is due to diaphragmatic weakness followed by paralysis (more usually on the right side initially), but it is usually accompanied by a weak cry and stridor.28 A chest radiograph may indicate an abnormal position of a hemidiaphragm. An ultrasound or fluoroscopic examination of the diaphragms can demonstrate abnormal movements, especially if paradoxical or weak/paralysed. H-type tracheo-oesophageal fistula. It is likely that as well as tachypnoea, the child would have marked symptoms on feeding, usually coughing, choking, turning blue and potentially recurrent lung infections. A tube oesophagram (video oesophagography) and/or bronchoscopy may be necessary to make the diagnosis, however. Upper airway narrowing may be obvious due to the presence of significant or persisting stridor, especially if the narrowing is more than mild. Possible causes include laryngotracheomalacia, bronchomalacia, laryngeal or tracheal web, subglottic stenosis. Tachypnoea accompanied by noisy breathing is an indication for a bronchoscopy (flexible or rigid). After careful examination by the cardiologist, inevitably children will have an ECG and echocardiogram performed to exclude a number of potential cardiac diagnoses. It is important to be aware that major cardiovascular disease may present initially during infancy with just mild tachypnoea. With increasing symptoms of tachypnoea and recurrent chest infections, cardiac disorders may masquerade as respiratory disease.30–32 Many causes are ‘silent’ meaning there is no murmur, so the diagnosis is not always obvious without assessment by a cardiologist (box 4). Tachypnoea during infancy without a heart murmur can occasionally be caused by a large atrial septal defect, pulmonary vein stenosis, cor triatriatum, mitral stenosis, hypertrophic cardiomyopathy and coarctation of the aorta. Transient neonatal myocardial ischaemia complicating birth asphyxia,33 anomalous origin of a coronary artery from the pulmonary trunk, dilated cardiomyopathy and myocarditis34 will manifest ‘T’ wave abnormalities and ischaemia or infarction on an ECG. ‘Silent’ heart disease in infants with pulmonary hypertension and a persistent elevation of pulmonary vascular resistance for several weeks35 ,36 may sometimes be associated with a large ventricular septal defect, complete atrioventricular septal defect (especially in babies with Down's Syndrome), large patent ductus arteriosus and common mixing situations in which mild arterial oxygen desaturation is not clinically obvious.37–39 Infants without heart disease may manifest a failure of a fall in pulmonary vascular resistance after birth, leading to mild tachypnoea, which can be a mild form of persistent pulmonary hypertension of the newborn.36 Almost all of these infants with pulmonary hypertension will have a prominent precordial impulse, loud pulmonary component of the second heart sound, right ventricular hypertrophy on an ECG, and cardiomegaly with or without pulmonary venous congestion on a chest radiograph. Whatever the cardiac anomaly, a good quality echocardiogram will usually provide a complete diagnosis. When tachypnoea without obvious stridor results from a vascular ring or pulmonary artery sling,40 a CT angiogram is also helpful in making the diagnosis. Gastro-oesophageal reflux is thought to cause tachypnoea, presumably due to discomfort from oesophagitis, but it would need to be quite severe to cause persistent symptoms; the child would not necessarily be vomiting. A pH study should be diagnostic, and in an infant a dual probe study is preferable in order to take account of any buffering of stomach acid by frequent milk feeds. Recurrent aspiration of fluid (eg, milk, saliva) can sometimes be silent, so the baby does not necessarily cough, splutter or choke when drinking. It is often idiopathic, sometimes associated with a bulbar palsy, and occasionally anatomical (eg, laryngeal cleft). Diagnosis is made by a speech therapist's clinical assessment, sometimes followed by a videofluoroscopic swallowing study. Particular consideration in babies with Down's syndrome should be given to congenital heart disease, infection, upper airway anomalies (narrow trachea, laryngomalacia, tracheomalacia and bronchomalacia), aspiration due to gastro-oesophageal reflux or swallowing abnormalities. Experience shows that in the absence of an underlying condition, the tachypnoea usually resolves, but may take as long as 6–12 months. This does mean that the cause in most babies is never determined. One can speculate the improvement is due to maturation of automatic control of breathing (based in the brainstem), response to chemoreceptors, or a change in the mechanical properties (compliance and volumes) of the lungs and chest wall.2 In those with a specific diagnosis, the outcome will depend on the actual diagnosis. The authors thank Prof Andrew Bush, Dr Siobhán Carr, Dr Mark Rosenthal and Dr Enitan Ogundipe for their advice on the manuscript.
. The history and physical examination. In: Wilmott RW, Boat TF, Bush A, Chernick V, Deterding RR, Ratjen F, eds. Kendig & Chernick's disorders of the respiratory tract in children. 8th edn. Philadelphia: Elsevier Saunders, 2012:110–30.
. Reference values for respiratory rate in the first 3 years of life. Pediatr 1994;94:350–5.
.; Paediatric Section of the Home Oxygen Guideline Development Group of the BTS Standards of Care Committee. BTS guidelines for home oxygen in children. Thorax 2009;64(Suppl 2):ii1–26.
. Arterial oxygen tension and response to oxygen breathing in differential diagnosis of congenital heart disease in infancy. Arch Dis Child 1976;47:707–15.
. 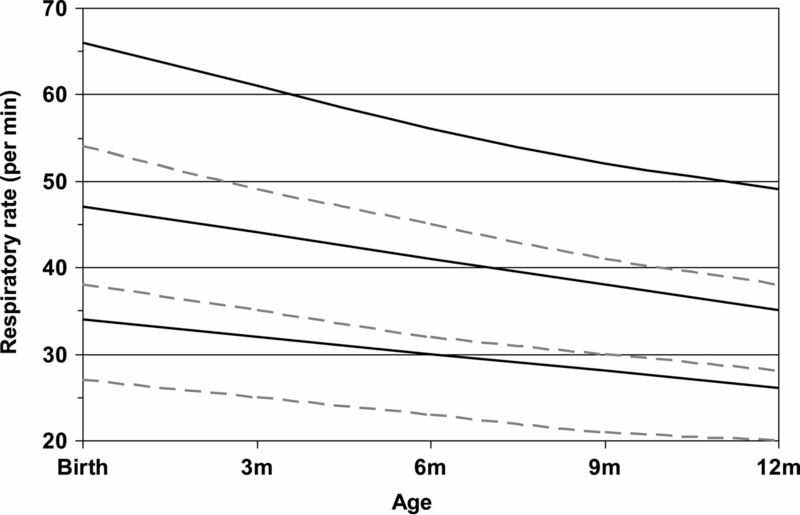 Pulmonary tuberculosis in infants under one year of age. Turk J Pediatr 2011;53:250–4.
. Pulmonary Disease in Cystic Fibrosis. In: Wilmott RW, Boat TF, Bush A, Chernick V, Deterding RR, Ratjen F, eds. Kendig & Chernick's Disorders of the respiratory tract in children. 8th edn. Philadelphia: Elsevier Saunders, 2012:770–80.
. Congenital malformations of the lungs and airways. In: Taussig LM, Le Souëf PN, Martinez FD, Landau LI, Morgan WJ, Sly PD, eds. Pediatric respiratory medicine. 2nd edn. Philadelphia: Mosby Elsevier, 2008:907–41.
. Respiratory function in infants with a ventricular septal defect. Austral Paed J 1972;8:79–85.
. Paediatric heart disease: a practical guide. Oxford: Wiley-Blackwell, 2012:20–5.
. The clinical diagnostic approach in congenital heart disease. In Freedom RM, Benson LN, Smallhorn JF. eds. Neonatal heart disease. London: Springer-Verlag, 1992: 165–78. Contributors MLR wrote the cardiology section and reviewed the rest of the article, IMBL wrote the rest of the article.